mk1-forum.net • View topic - Door Mirrors for a Mk1? Door Mirrors for a Mk1? Post subject: Door Mirrors for a Mk1? Looking for your advice on what is the best suited "Door Mirror" available today to fit on my early 997 Cooper. 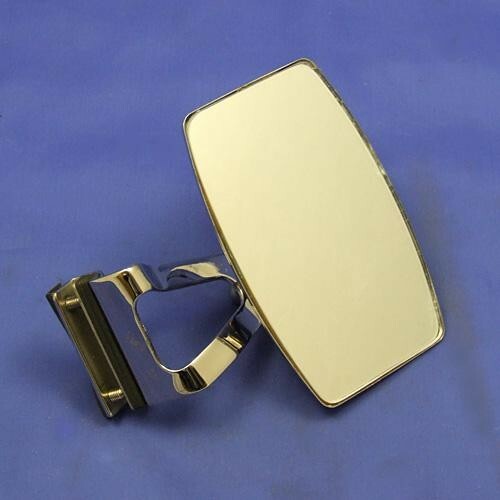 Mini Spares have a host of Bullet Mirrors available .. but what is best suited in design or type of Door Mirror(s) from whatever supplier that will be usable but still look OK on a 1961 car ? I am Not a Purist that my car has to be 100% original.. yet i struggle on our UK Roads today without a good rear view! Post subject: Re: Door Mirrors for a Mk1? Personally I find all door mirrors pretty rubbish on Minis, I don't use any myself, & just turn around a lot. However, I thinkthe stadium type clip on mirror is best, its very original looking & you can actually see stuff out of it. https://www.vintagecarparts.co.uk/parts_index/mirror Type 981 I think. Beware of those clip on ones when buying. I got a cheapo replica one a few years ago, fitted it to the car only to find that the door frame hit the mirror when I opened the door. Holden have a good selection for browsing through, they even do convex replacement glasses for the popular bullet type that fits through the window catch, look in the Racing Mirror section. Saw these on a few cars at IMM and they looked great. Nice and compact like a Downton mirror, but with a proper base and loads of adjustment. My car has reproduction Lucas, round, flat mirrors on the doors. While working on the doors (prior to painting) I tack welded nut bars on the inside of the door skins so I could use machine screws to attach the mirrors instead of using sheet metal screws. My mirrors don't vibrate "too much" and can be adjusted by sliding the front glass back. They may not be ideal but they don't look out of place and they work. That was the solution I came up with too and found most successful. I had tried the Raydyot type which fit to the window catches but found that, as I drive with the window open most of the time, it was useless! Does anyone know who does the Bullet type that bolts through the glass as opposed to the Raydot /Downton ish round ones ? This is the setup I have and I find it pretty useless. Can see almost nothing out of it Like Mark I just turn around a lot! I do have a Barnacle on the windscreen that I find very very helpful, though. I've been on the lookout on eBay because I'd like to pick up a second one, but when they come up they are not cheap.